1. Take boiled mashed potatos in a vessel. 2. Add ginger, green chilli, garlic paste & handful of coriander leaves. 3. Add 1 tsp red chilli powder, salt & lemon juice. 4. Mix all ingredients properly. 5. Add 2 tsp oil in a kadhai. Heat the oil. 6. Add mustard seeds, cumin seeds, turmeric powder, hing & curry leaves. Add onion & saute till it becomes translucent. 7. Add potato mixture into it. 9. Prepare small balls of this mixture. Add basan in a bowl. Add 1/2 tsp turmrtic powder, 1/2 tsp red chilli powder, salt as per taste. Add water to make smooth paste. Add a pinch of soda bicarb (optional). Grease Appe pan with little oil. Dip the potato balls in besan batter. Place the balls in Appe pan. 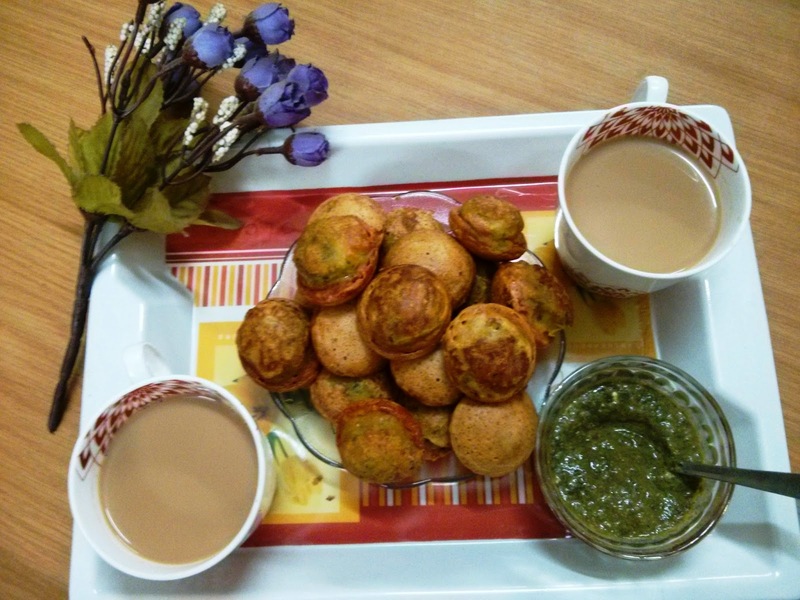 Enjoy the guilt free hot batatevade with chutney & hot cup of tea!!! !